Fort Wayne based artist, Tricia Cavender, has been honing her skills in Acrylic and Oil Painting for the past several years. Tricia is a national and international selling acrylic and oil artist. She uses influences from her childhood experiences and is very inspired by color studies and how it affects the viewer’s emotions. She loves to challenge herself in new projects. Tricia has owned two art galleries and is currently the owner of Rhapsody Art Gallery and Studio in Fort Wayne, IN. One of her passions is to bring art and art appreciation to the public in the form of experiences and workshops. 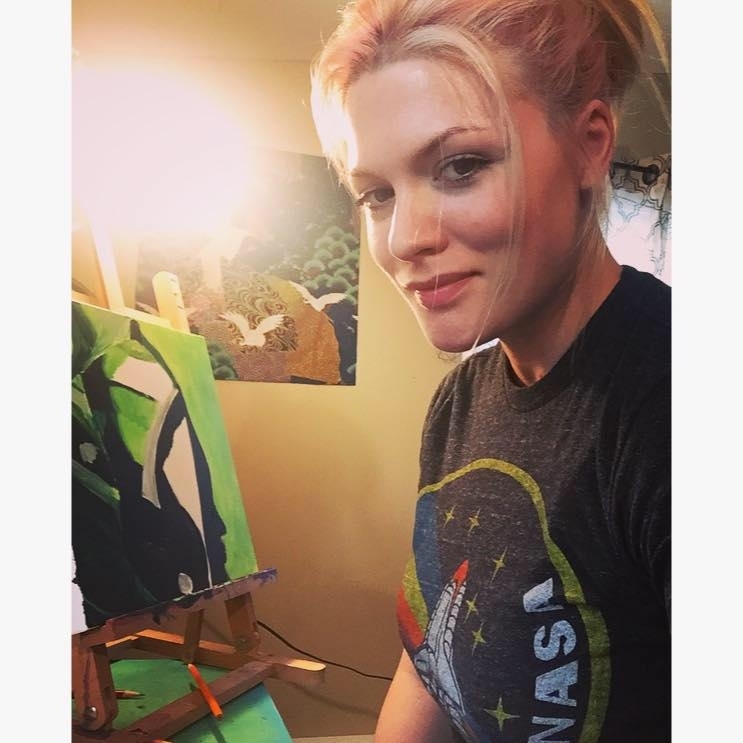 She has shown in many art shows, serves on the boards of festivals and art committees and helped create a local art collective that enables artists to show their art in public venues. Originally a professional hair and makeup artist for 20 years, Tricia has used creativity in every aspect of her life and career. With both of her parents being artists and musicians, she has always had art in her life. She has been a painter since 2013. “I see art in everything around me and I have always had an insatiable curiosity and a stubborn drive in life. I have learned to call myself an artist after a few years. Sometimes your passions find you. Both of my parents are artists. My son has also fallen in love with the creative life. There is an artist in everyone, whether they are aware of it or not." As long as I can remember I’ve had an interest in art. Art has always been an outlet for me no matter what was going on in my life. My style has evolved and changed with me. The style pop surrealism is inspiring to me. Three years ago I started watercolor painting instead of drawing and pastel, and I absolutely love it. My favorite books, hours I’ve spent on Pinterest, pictures of animals and people, stories about aliens; things that help make my ideas come to life are what inspire me. That is what I try to convey through my paintings. Justin Zych is a musician specializing in guitar, bass, and piano. He earned a bachelors degree in music performance from IPFW and currently teaches music at Rhapsody Art Gallery. He is an experienced international touring musician, who as worked with world renowned bands such as Viking (CA), THEM (NY/GER), Munroe's Thunder (USA/UK), and many others. He is also a composer/arranger who's work has been purchased by schools and organizations around the world. With over 100+ transcriptions written for clients, Justin is available for transcribing music into sheet music for any instrument. Along with teaching and music transciptions, Justin continues to be hired for live music shows and studio recordings for many clients and is always looking forward to working with new people and ensembles.